Choosing a healthy nighttime snack can sometimes become more complicated than it seems. Obviously, you want to eat enough to satisfy hunger pangs, but you don’t want to eat too much or go overboard on sugar or caffeine, which can disrupt a night of good sleep. When in doubt, choose natural foods that offer sleep-inducing help from tryptophan, vitamin B-6, and a combination of complex carbs and protein. Calcium helps your body use tryptophan to build melatonin, a hormone that helps induce sleep naturally. Dairy products may be the most obvious sources of calcium, but leafy greens are lower-calorie alternatives that also provide generous amounts of the nutrient. Dark leafy greens, such as spinach, mustard greens and kale, are especially healthy choices for nighttime snacks. 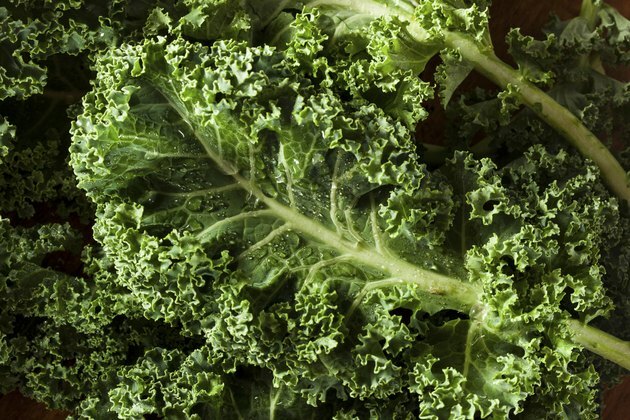 According to the USDA National Nutrient Database, 2 cups of chopped kale contains about 200 milligrams of calcium, which is the same amount as in a 4-ounce container of plain low-fat yogurt. Oatmeal has more protein than most cereals, and it's also a rich source of complex carbohydrates, which take longer for the body to digest than simple carbs. According to "Fitness" magazine, the combination of protein and complex carbs produces serotonin, another hormone that can stimulate melatonin production. To get more protein than the oats themselves provide, pair the cooked oatmeal with skim milk or plain nonfat yogurt. ChooseMyPlate.gov recommends eating 8 ounces of fish or seafood every week, and nighttime might just be the right time to nosh on it. According to “EatingWell” nutrition editor and registered dietitian Brierley Wright, most fish are healthy sources of vitamin B-6, another nutrient that your body needs to make melatonin. Salmon, tuna and halibut offer especially hefty amounts of B-6, but it's also found in almost any low-mercury source of seafood, along with a healthy balance of other vitamins and minerals. Cheese and crackers is another combination that hits on the successful nighttime pairing of protein and complex carbs. To keep the snack healthy, though, make sure you read the nutrition labels of what you’re eating. Dozens of cracker varieties are made with highly processed white flour and additives that offer little if any nutritional value, and full-fat cheese is high in calories and can disturb sleep since it’s not easy for your body to digest. A healthy option should provide about 150 calories and combine whole-grain crackers with reduced-fat cheese or naturally lighter varieties, such as feta or Neufchatel. ChooseMyPlate.gov: Why Is It Important to Make Lean or Low-Fat Choices from the Protein Foods Group?